January 22, 2019 10:30 pm. The man who shredded Hong Kong racing’s record books is aiming to help an old ally to a significant milestone at Happy Valley on Wednesday (23 January). 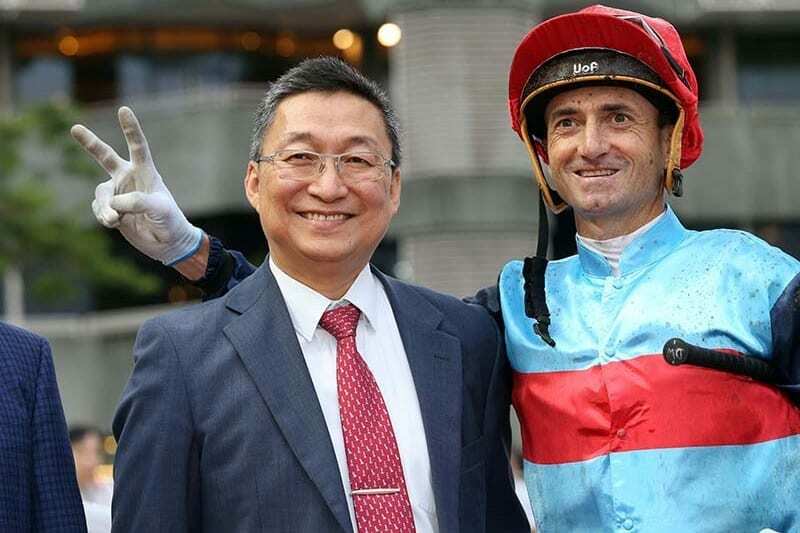 Douglas Whyte spent a hectic Tuesday morning explaining his impending retirement from the saddle but it will be business as usual as he bids to help Francis Lui get the one success he needs to reach 600 winners spread across more than 20 years as a trainer. Whyte’s arrival in Hong Kong in 1996 coincided with the start of Lui’s training career and the pair have joined forces to good effect on many occasions. “Francis has been a great supporter of mine and we’ve had a lot of good days,” said the most successful rider in Hong Kong history. Whyte will partner Alpha Hedge for Lui in the Siu Sai Wan Handicap (1650m) and also gets the leg up on stablemate Happy Time in the Son Kon Po Handicap (1200m). John Moore, Tony Cruz, John Size, Caspar Fownes, Dennis Yip and Ricky Yiu are longstanding members of the 600-club, while Tony Millard was also welcomed into the fold recently. Vincent Ho has been Lui’s most successful jockey this season – partnering eight of his 11 winners – and the in-form rider feels Golden Cannon could add to the total in the Sham Shui Po Handicap (1650m). Ho links up with Lui again aboard Racing Luck in the closing Tai Hang Tung Handicap (1650m) but fears the recent course and distance winner will have to live up to his name to follow up. Trainer John Moore’s Helene Charisma arrived in Hong Kong having beaten subsequent G1 Prix de l’Arc de Triomphe runner-up Cloth Of Stars and G1 Breeders’ Cup Turf hero Talismanic in the 2016 G1 Grand Prix de Paris. The six-year-old has also finished ahead of some of Hong Kong’s biggest stars including Beauty Generation, Designs On Rome and Eagle Way. But the gelding’s subsequent fall from grace has been slow and sure and on Wednesday he lines up in the Class 3 Southorn Handicap (1800m) racing off a mark of 74, still winless after 26 starts in the city. The six-year-old did, however, finish a good third at Sha Tin on his latest start and has spent most of the last seven weeks in a more relaxed environment at Conghua. Whyte was in the saddle for his latest run and takes the reins again. The 13-time champion said: “Some horses take so long to win that they become thinkers and you never know which Helene Charisma will turn up. Travel Datuk is another European import who has come down in the world and his Hong Kong record – currently 0-28 – sounds a note of caution ahead of the Class 4 Hong Kong Football Club Centenary Cup (1200m). However, a low draw can be helpful over 1200m on the Valley’s C course and Matthew Chadwick feels stall one is a plus.